The Story Of Fats Domino's 'Ain't That A Shame' This enduring hit showcases Domino's individual talents, and the early power of New Orleans music. Legendary American jazz pianist and singer Fats Domino. 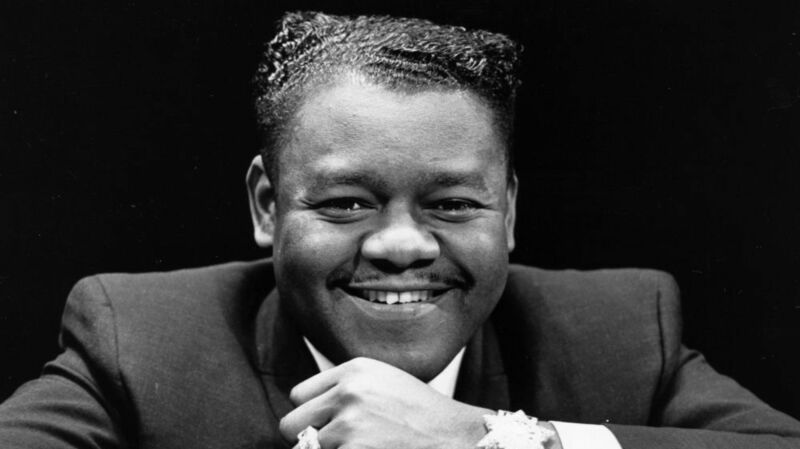 Sunday marked Fats Domino's 84th birthday. Hear the story — which aired on All Things Considered on May 1, 2000 — behind his breakthrough hit, "Ain't That A Shame." Since this story aired, Fats' home in New Orleans was destroyed by Hurricane Katrina. He and his family now live in Harvey, La. Antoine Domino is the Louisiana French name for the man whose honey voice, Creole inflection, rock-steady piano triplets and basic boogie blues and love songs endeared him to the world in the 1950s, as New Orleans rhythm and blues flowed into and helped define the mainstream of American rock 'n' roll. Born in 1928, Fats Domino was the youngest of eight children in a French Creole family. He grew up only a few blocks from where he lives now, downriver from the French Quarter in the Ninth Ward. Today it's a mixed residential and industrial neighborhood, but in Fats' youth, it was pretty much country with unpaved roads, no electricity and small farms. While Fats' father, Antoine Sr., played the fiddle, it was brother-in-law Harrison Verette, a jazz banjo player, who taught young Fats piano. The quasi-biographical song, "The Fat Man," was made for Imperial Records in 1949. Like many of Domino's songs, it was co-written by the man who Fats came to count on as a producer and arranger, Dave Bartholomew. Bartholomew, now almost 80 years old, still lives and plays trumpet in New Orleans. He'd be the first to tell you that Fats is and always was extremely shy. Domino, who's 72, lives in seclusion, as he has since the early '60s, in a sort of chieftain's compound that is oddly extravagant and modest at the same time. The main house is a classic New Orleans style shotgun double, yellow with black trim. Then there's the cream, green and pink building that's home to his childhood sweetheart and wife, Rosemary. Around the compound is an elaborate iron fence, trimmed in pink and green, ornamented by bas-relief grapevines. A neon sign under one eave proclaims, "Fats Domino Publishing." There are two grand pianos in this down-home graceland, one white, one black. Large dominoes are inlaid in the entryway tower. The centerpiece of the living room is a pink Cadillac tailfin couch. But the king on this throne rarely gives interviews, sticking instead to home cooking and unannounced outings to neighborhood bars in one of his Rolls-Royces. In 1999, when awarded the presidential medal of the arts, Fats dispatched his daughter, Antoinette, to the White House. At first, Fats reluctantly agreed to be interviewed for the radio. But he canceled time and again. "What about 'Ain't That a Shame'?" I asked. "Oh," Fats demurred, "I've been asked about that a thousand times." A rare Fats Domino performance invariably brings out a cross-section of people. In standing-room-only clubs and in throngs at jazz fests, they sing and sway to the music of this inscrutable Buddha of New Orleans with his ring-encrusted hands and dapper colored suits. Fats' ability to both move people and bring them together goes back to at least 1955, the year he recorded, "Ain't That a Shame." It was the first of Domino's big hits not recorded in New Orleans. Instead, "Ain't That a Shame" was put onto tape in a Hollywood studio on March 15th when Fats was on tour in Los Angeles where he played the popular 5-4 Ballroom. Like nearly all Domino recordings, Imperial Records tweaked the song a bit before issuing the 45. The sound was compressed to make it punchier and speeded up slightly to make Fats seem more youthful and less bluesy. New Orleans studio producer Cosimo Matassa, who worked on the Domino hit-producing sessions back home, speculates that speeding up the songs made it harder for other artists to copy. Fear of imitation was quite legitimate, as many R&B artists had their songs covered by white pop performers whose versions were often more palatable to the mainstream public. A cover by country legend Pat Boone did not smother the success of Domino's original, which not only stayed at the top of the R&B charts for almost three months, but made history when it crossed over to the top of the dominantly white pop charts. Fats recalls that the president of Imperial Records, Lew Chudd, told him, "Your record's goin' pop. You got a big record." Indeed. This enduring hit showcases Domino's powerful blues piano and stop-time, swamp-pop texture with an abundance of saxophones, plus that warm Creole-accented voice telling the simple but sincere story of romance found and lost. On "Ain't That a Shame," the sax players are Herb Hardesty on lead, with Samuel Lee and Buddy Hagens; Walter "Papoose" Nelson on guitar; Billy Diamond, bass; Cornelius Tenoo Coleman, drums; and Antoine "Fats" Domino on piano and vocals.